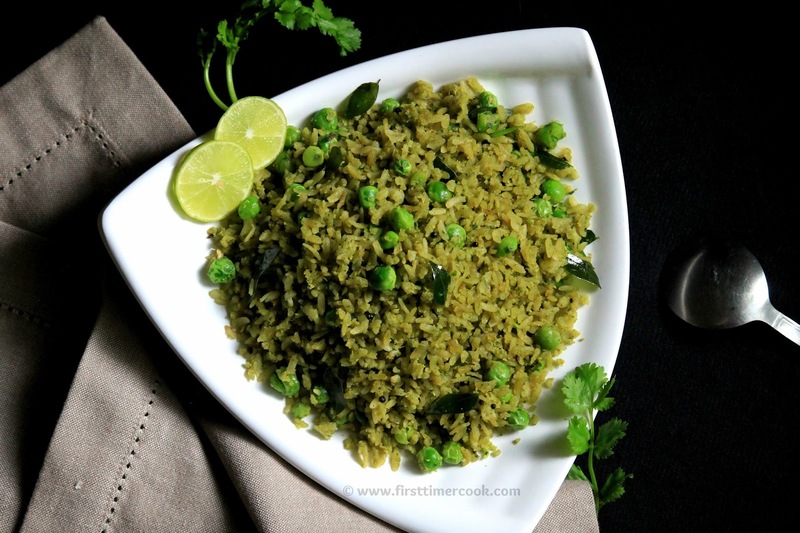 Coriander Poha with green peas - flattened rice flakes along with green peas tossed with fresh, aromatic coriander paste. Monday is here again !! 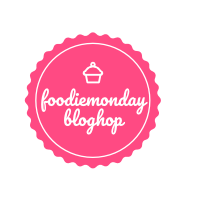 This time the Foodie Monday Blog Hop team have decided a theme as 'dishes using Green Leaves' which means to prepare a dish by using any leafy green vegetable. So I have chosen coriander leaves or dhania pata to match with the theme. And yes, I have prepared coriander poha with green peas where the poha or flattened rice flakes along with green peas are cooked with a coarse paste of coriander leaves. Coriander, popularly known as dhania in Indian subcontinent, is an aromatic herb with wide, delicate lacy leaves and a pungent smell. All parts of the plant are edible, but traditionally the fresh leaves and the dried seeds are the parts used most in cooking. So basically coriander is extensively used across various cuisines for flavoring and garnishing as well. The leaves part are often used raw and added to the dish just before serving as heat tends to lessen its flavor rapidly. Coriander is packed with a bunch of health and medicinal benefits. Due to its numerous nutritional values, it is also regarded as Wonder Herb. In Ayurveda, it is often recommended for stomach related ailments as it helps in proper secretion of enzymes and digestive juices in the stomach, stimulates digestion, peristaltic motion and prevents flatulence. Also it is good for diabetes, helps in proper bowel movement, lowers cholesterol, prevents arthritis, maintain a healthy kidney and lots more as well. So we should include this wonder herb in our diet most of the times. Coriander Poha with green peas is a simple yet flavorful dish. Basically a coarse paste is prepared from fresh coriander leaves with some grated coconut. Then the soaked and drained poha is cooked with that flavorful paste. Here I have added some green peas (fresh or frozen) along with flatten rice flakes, but addition of green peas is totally optional. This is a quick as well as a tasty dish which can be served as breakfast or tiffin. This can be best suited for kids tiffin box too. Curd or any pachadi is served as an accompaniment with this coriander poha. I personally prefer to have simply as it is with some hot tea. 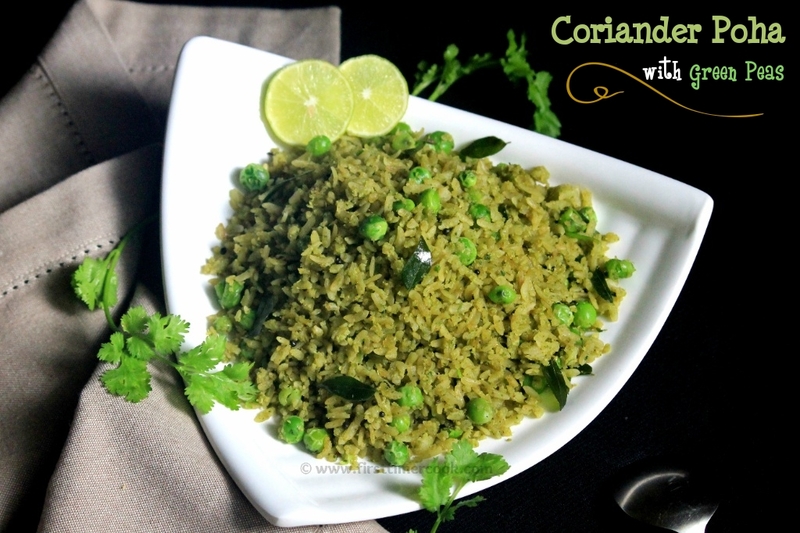 So below is the details method of preparation of this simple yet flavorful coriander poha with green peas. Wash the flattened rice and drain completely. Keep aside. Next grind grated coconut, roughly chopped coriander leaves, green chilies, jaggery, lemon juice without adding water to make a coarse mixture. Then heat oil in a nonstick pan. Add mustard seeds, cumin seeds and allow to splutter. Add urad dal, curry leaves, asafoetida and turmeric powder and fry for few seconds. Next add green peas and saute for 1-2 minutes. Now the poha, salt and mix well. Finally add the coriander mixture and mix till everything well incorporated. Sprinkle some water and cover with a lid. Cook for 2-3 minutes and then turn off the heat. Serve warm with curd or any pachadi or simply as it is ! Red flattened rice flakes can be used. Rasam powder or sambar powder can also be added while grinding. Addition of green peas is optional. Coriander poha looks delicious. So innovative. You can call it chutney poha too. Perfect breakfast recipe. I love anything with coriander and this recipe would elevate my regular Poha to a new level. 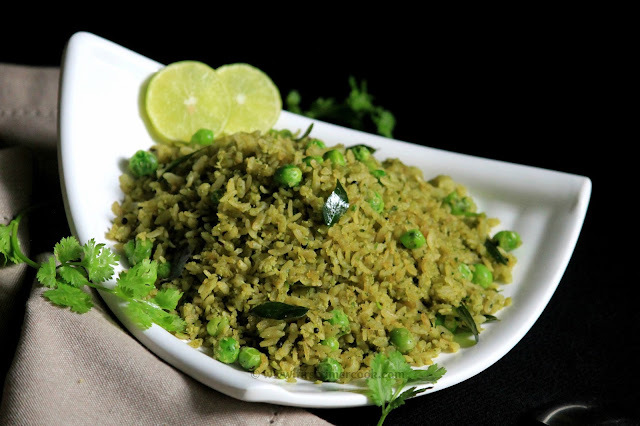 Beautifully green looking Poha!So innovative! 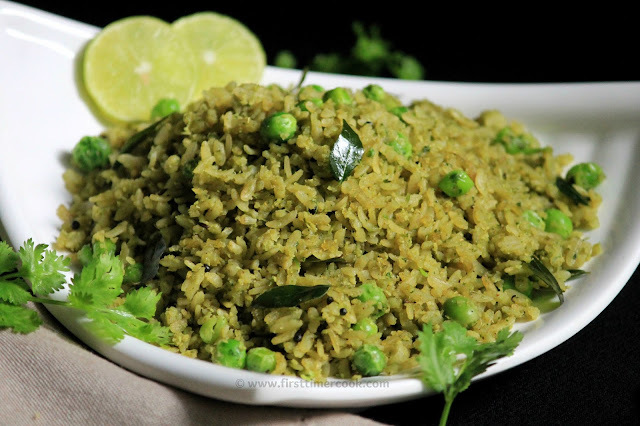 I love this poha recipe, so delicious! 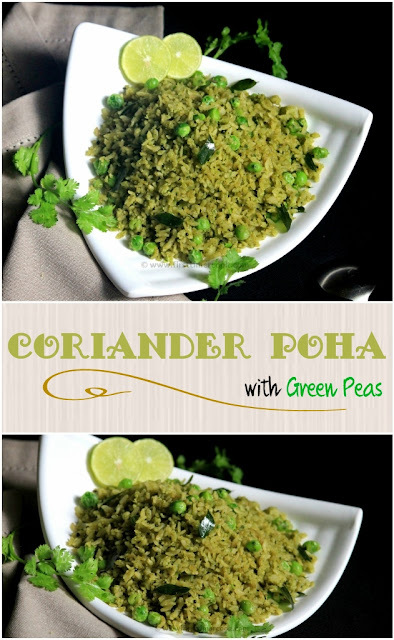 Sasmita love this coriander poha... a different kind from the normal. Looks very nice. This looks delicious. I will need to try it! I was wondering what I need to do for the breakfast tomoro and I see this. Lovely. Trying this out tomoro morning itself!!! Innovative twist to simple poha!! Fab share Sasmita.